Free poster board is available to students and parents of participating schools only. If you purchase your own board, choose smooth 23”x 29” or 22″ x 28″ poster tag board. We do not recommend thick, matte board and foam core boards because they are too thick and cannot be laminated. We also do not recommend solid black or textured boards because bubbles may show when laminated. Poster design must be done vertically (23” width by 29” height). Include graduate’s name and high school in your design. Once your poster is laminated, original items on the poster cannot be removed. We recommend using copies of your items and memorabilia on your poster rather than originals. Do NOT use rubber cement, double-sided tape, spray glue or scrapbook tape. These may cause a heat activated reaction that can cause air bubbles and items to shift in the laminator. Items should not extend beyond the edge of the poster board. Limit layering items on your board to 1 to 2 layers. This prevents air bubbles once the poster is laminated. 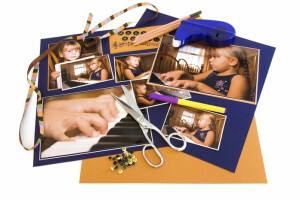 3-D scrapbook items may be too thick to fit through the laminator. Cornerstone Copy Center (Lakeville & Burnsville) will laminate your poster for $10 + tax.